Up and at 'em! Get your day started off right with the regal beauty of the Kate Spade New York® Rise and Shine Small Stud Earrings. Faceted stone centerpiece with three clear glass stones at perimeter. We can't currently find any similar items for the Rise and Shine Small Studs Earrings by Kate Spade New York. Sorry! 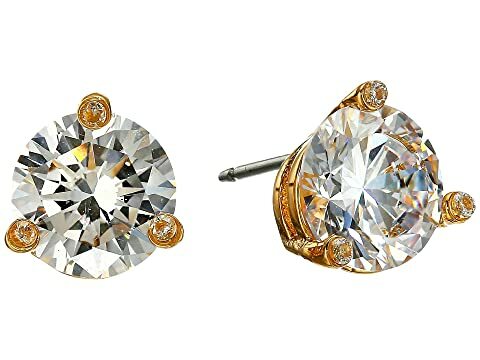 I love these classic earrings! The post isn’t centered but it didn’t make a difference once you put it on. You can’t go wrong with these! The post is not centered as I had hoped it was. One of the stones was also loose but seemed to be secure enough that it wasn’t going to come out. They were very pretty earrings but the non-centered post led to a return for me. I LOVE these earrings! I am actually on my second pair because I lost my first pair. They are perfect for everyday because they go with everything. My ears are fairly sensitive and these have never bothered me.